Subset Key: AA=All-Americans, M=Mascots, SG=Stained Glass. 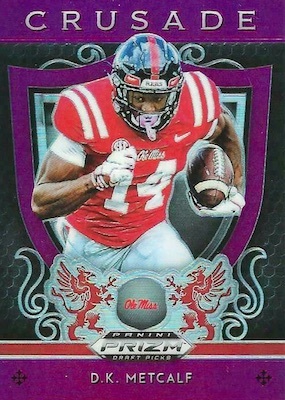 PRIZMS PARALLELS: Silver, Blue, Orange, Pink Pulsar, Purple, Red, Red/White/Blue #/99, Hyper #/75, Mojo #/49, Camo #/25, White Sparkle #/15, Gold #/10, Green #/5, Black 1/1. PRIZMS PARALLELS: Blue, Orange, Purple, Red, Red/White/Blue #/99 or #/49, Hyper #/75 or #/25, Mojo #/49 or #/20, Camo #/25 or #/15, Gold #/10, Green #/5, Black 1/1. PARALLEL CARDS: Hyper #/20, Mojo #/15, Gold #/10, Green #/5, Black 1/1. 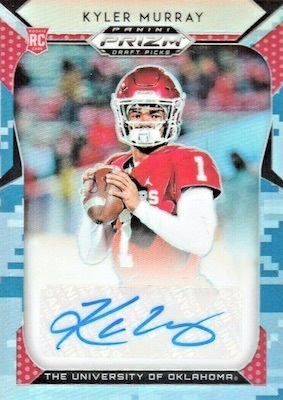 PRIZMS PARALLELS: Blue, Orange, Pink Pulsar, Purple, Red, Red/White/Blue #/99, Hyper #/75, Mojo #/49, Camo #/25, White Sparkle #/15, Gold #/10, Green #/5, Black 1/1.